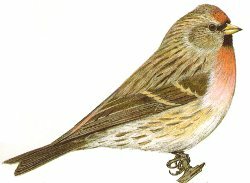 A small slim finch, the Redpoll is a brown and whitish streaked bird, the male has a pink forehead and breast, the female has only a pale red forehead. 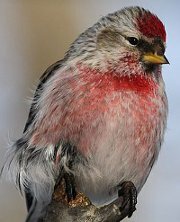 The female lacks the red breast of the male, her back is more tawny-buff colour. Females often have no pink at all and as males can also have only a pink forehead during moult, separating male from female can be difficult. 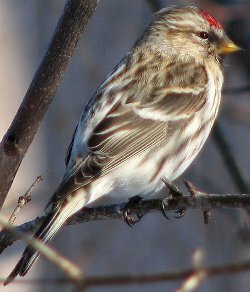 The male Redpoll in summer plumage is a distinctive little bird, difficult to confuse with other species. Female or winter Male? In reality it is difficult to be sure, however the tawny buff hue on this birds back may indicate that this bird is female. Thinly distributed throughout Europe, including the very North and Iceland. Has a high tolerance of colder climates. A scarce resident bird in the UK although in the very South of England is present only in winter. 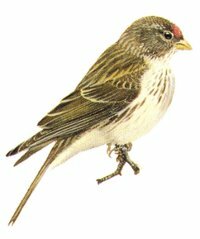 Only around 300 birds are recorded each year in the UK and less than 3 breeding pairs have been identified. Bushy heaths, Larch forest and Silver Birch with a preference for higher altitudes. The differences between these birds is in most cases slight and can only be established by detailed examination of a bird in the hand. I will write a detailed ID guide on these in the future.